Again, just trying to catch up. Life has a way of messing up well laid plans. 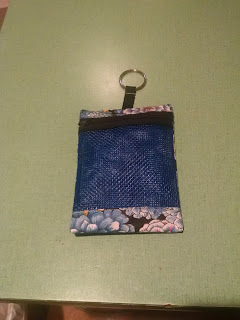 For this week's project, I made a few small wallets that hold folded bills, coins and cards. I used corks for the "buttons", just for the fun of it. This is a pattern from Lazy Girl Designs. It's called the "Wonder Wallet". It goes together quickly and is pretty cute and functional. I attended the San Diego Quilt show a few weekends back. I think it has improved over the last several years, so if you haven't been lately, try to attend next year. I don't think you will be disappointed. Sorry I don't have any pictures from the show. In the next blog post, I will share some pictures from a quilt show that I attended in Aliso Viego. Until next time, keep on quilting. 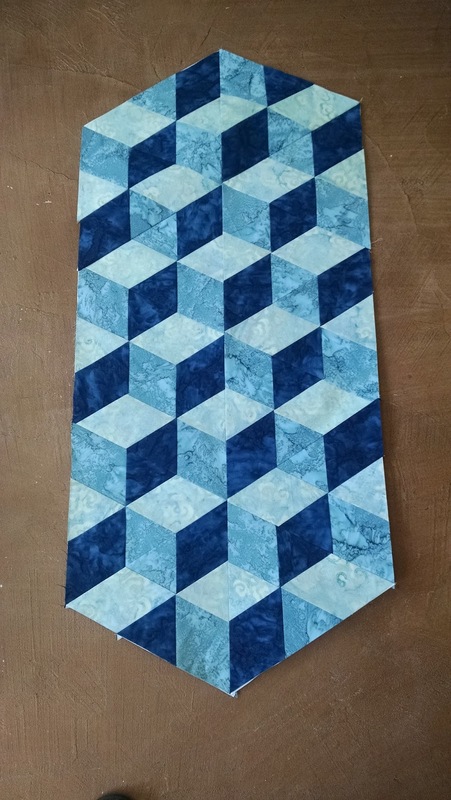 For this week's project, I did a class sample for tumbling blocks (the easy way). 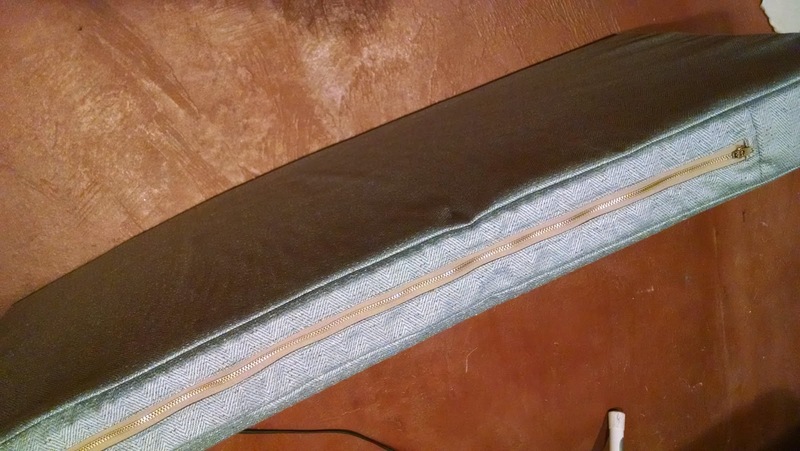 Normally with this block, you have to sew a y seam. Not an easy task. The way I taught this was so much easier than the old fashioned way. 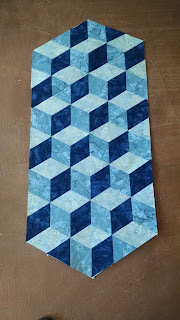 It does involve a little paper piecing, but who doesn't love paper piecing? 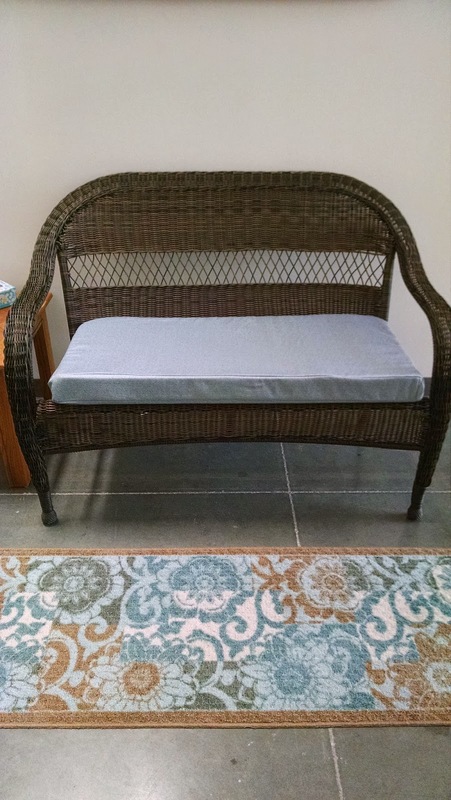 I'm going to put binding around the ends and call it a table runner. Want to learn how to do it? Just let me know and I'll have another class. It really is easy and fun. Again, trying to catch up. 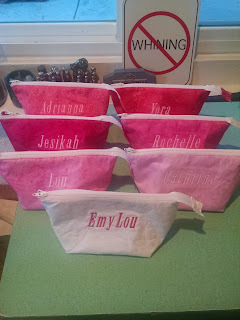 For this week's project, I made a bunch of bags for a wedding party and embroidered their names on them. They turned out well, again, from the wide mouth bag pattern from noodlehead.com. This woman has some amazing patterns. Check it out. I especially like the sign in the background. It sure seems fitting for my studio. So until next time, keep on quilting. 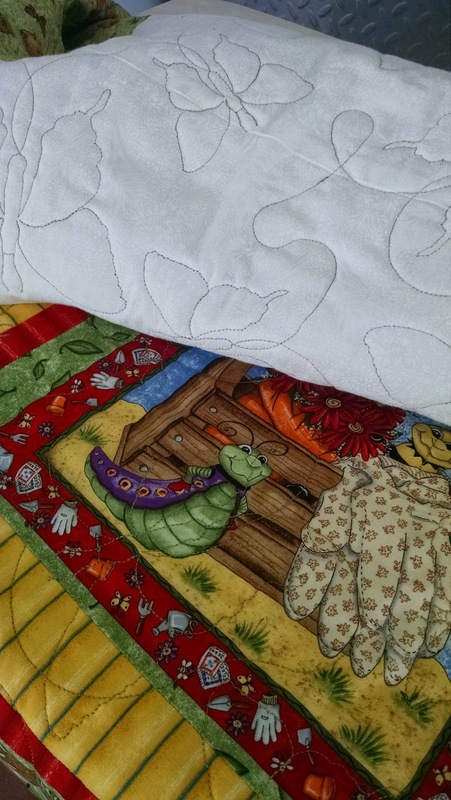 So for this week, I actually quilted someone else's quilt. Her name is Sue and she owns a quilting store in Temecula, CA. This turned out to be all custom work and it turned out pretty well. The quilt itself is a medallion quilt and I do believe most of the fabric is from the cotton and steel collection, but I could be mistaken. I totally had fun doing this on my Statler. Although it was a bit of work, I enjoyed it a lot. I have since been to Missouri for a 4 day Statler conference and have learned more about the awesome Statler stitcher that I purchased last year at Houston. The only thing this amazing machine doesn't do is cook for me. (well that is about what it seems like). I am learning all kinds of things related to CAD and all the ins and outs. 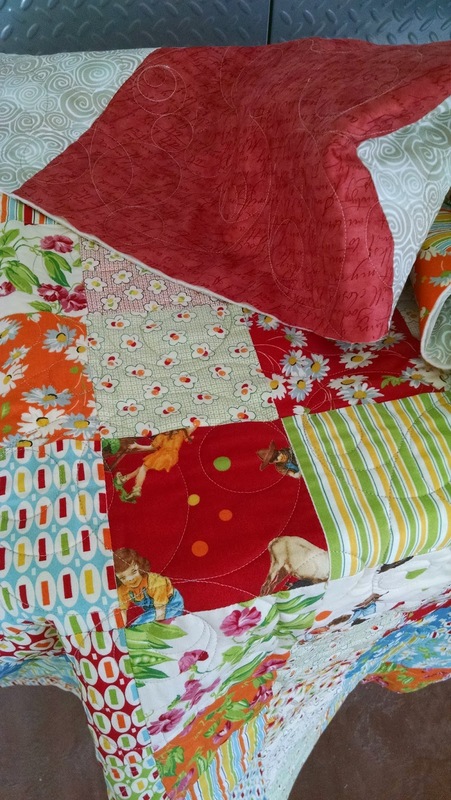 I am in the process of doing donation quilts so I can play daily on the machine. 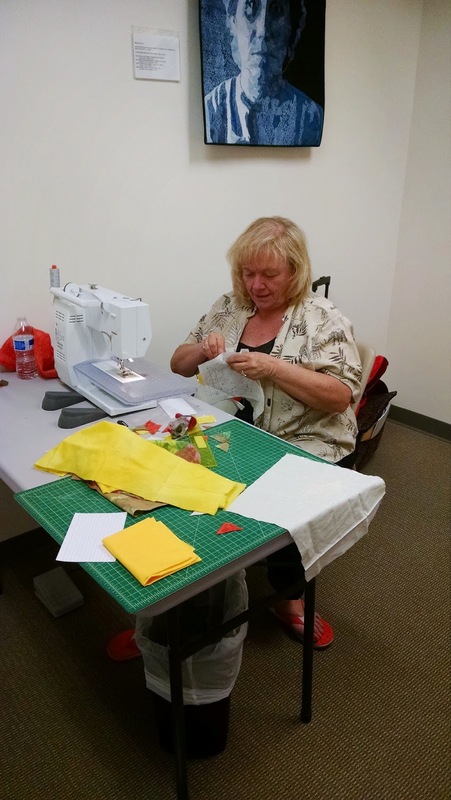 My local quilt guilds are doing pretty well with donation quilts for next month. I have 4 to bind at the present and will do so next weekend while I'm in Malibu. 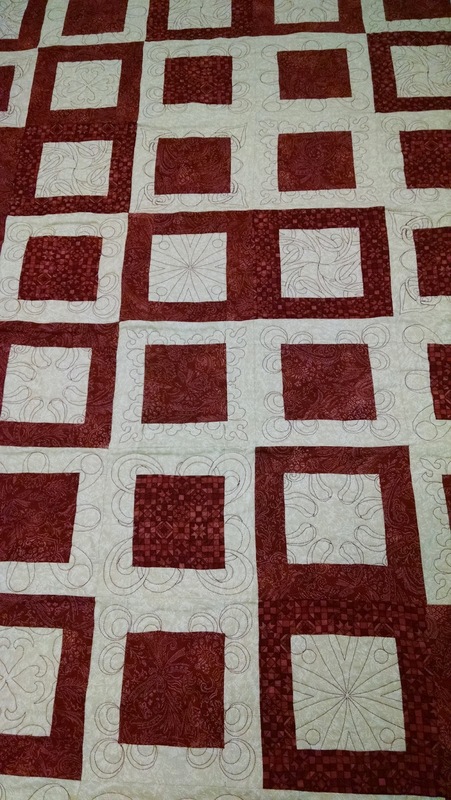 Until tomorrow, week 24, happy quilting to all of you. Okay, let's do this...For week 22, I made a bag, rather a pouch. 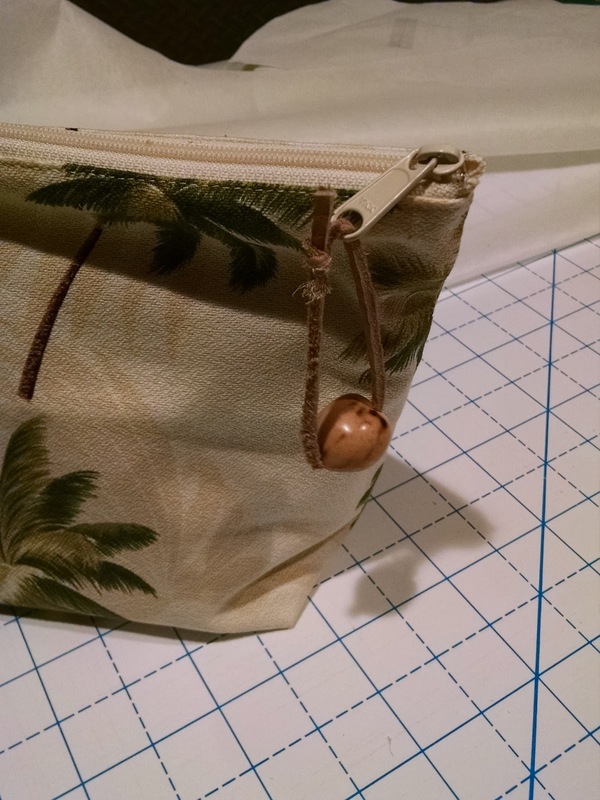 I found this little treasure in Hawaii and thought, "that would be kinda cool if it was a little bigger to carry your phone and keys", I adapted the pattern and made it to fit my needs. 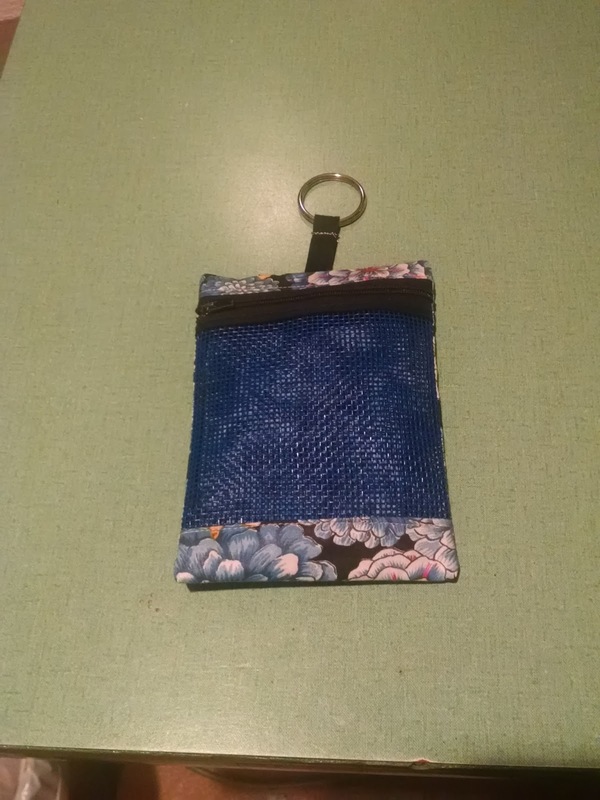 I used mesh and fabric and added a ring to attach keys and you can also attach it to your belt loop so you don't have to carry it. I like it. I hope you do too. Tomorrow, I will be up to week 23, still have 5 weeks to catch up but I have all the projects done (and then some) so I think I can do it. 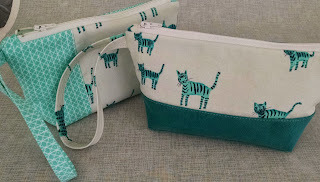 I have been ultra busy between sewing, working, quilting, travelling and teaching classes. I may not be a blogger but I intend to be dedicated to the cause. 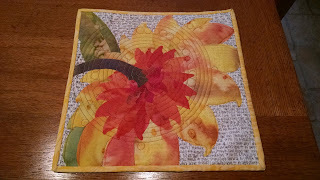 So, until tomorrow.....Keep on quilting. I'm desperately trying to catch up on my project of the week. I plan (we know how that works) to do a "week" everyday till I catch up. So here goes week 21. 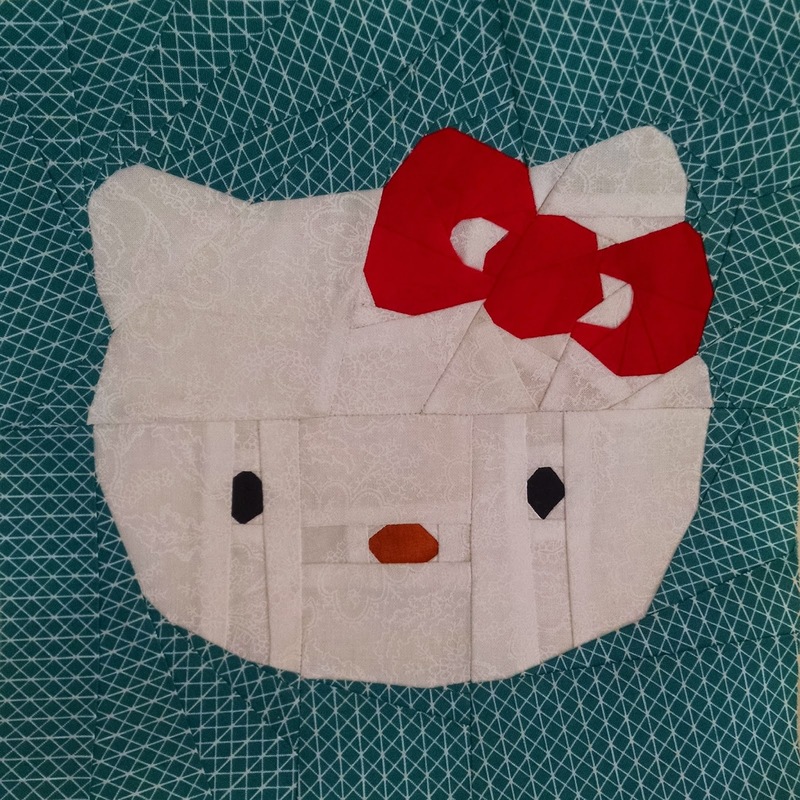 For this week's project, I used a class sample and made it into a 12x12 quilt for a donation quilt to SAQA. I used my hand painted fabrics to make the appliqued flower and fused it onto an awesome commerical fabric with printed text on it. 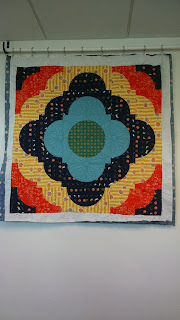 I then quilted it, did the binding and viola......A quilt. The class was also a success. We had lots of fun and I think everyone had a great time. I know I did. Okay, so I am way behind. It doesn't mean that I haven't been productive,it just means I have not spent the time blogging about it. I have to apologize. The only way that I can show, teach, question, grow...whatever..is to keep up with the blogging. I honestly try to do better but I am a slider. 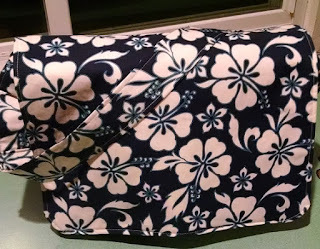 For week 20, I did make a medium size messenger bag. The size turned out good, it was difficult because I used the same fabric for every piece. 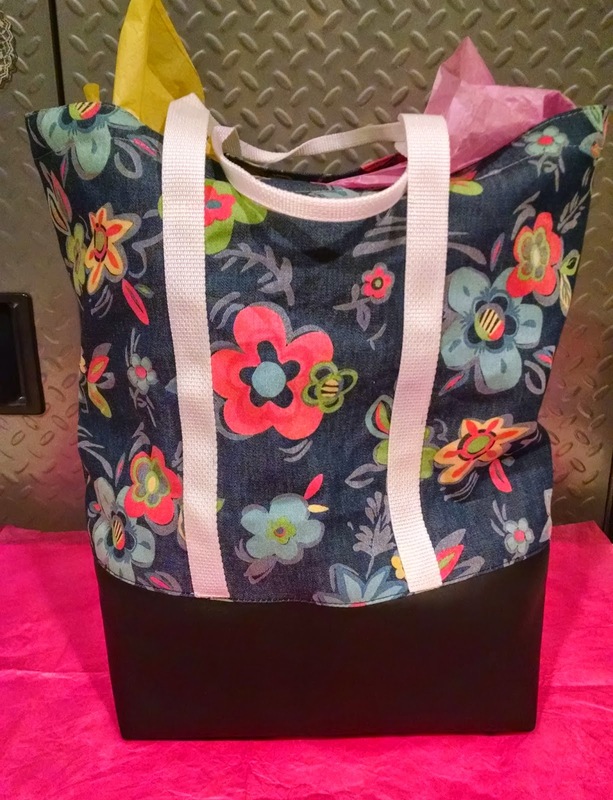 I liked the size and will add it to the list of bags that I will make again. Well, time sure flies if you are having fun or not. I can't believe that almost half the year is over. For this week's project, I've been trying to find the perfect messenger bag. I feel like Goldilocks and the three bears. This one is too big, this one is too small and I'm just trying to make one that's just right. Maybe, it is going to have to be two or three different bags for it to be "just right". The first bag I made, although cute, was too big, in my opinion. Some people that I surveyed loved it, so I guess it will have to be a custom order. It measures a whopping 16 inches x 14 inches. It has one pocket inside but I think you can fit our home computer in it, not just a laptop. The next bag was a good size for a tablet and other stuff. 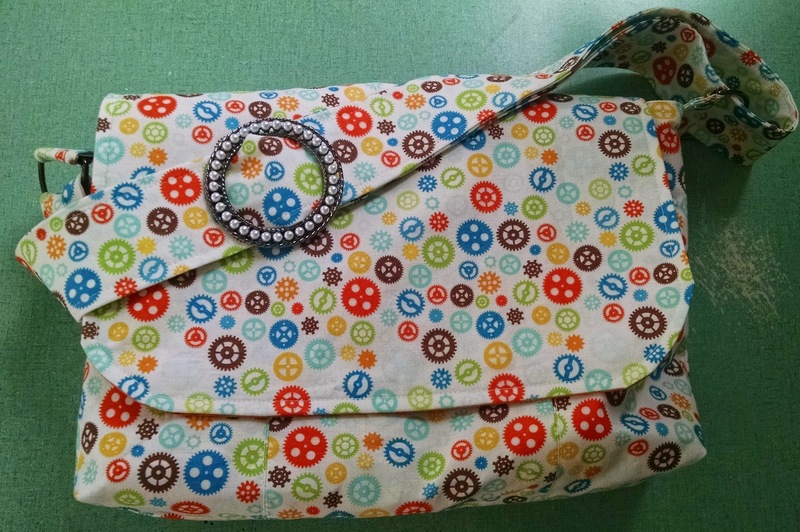 It has a zipper pocket and several compartment pockets inside and an extra pocket on the front. I used a vintage like strap slider and I really liked the design. It measured 8 inches tall , 11 inches wide and 3 inches deep. I am now working on a third bag that will be a medium size. 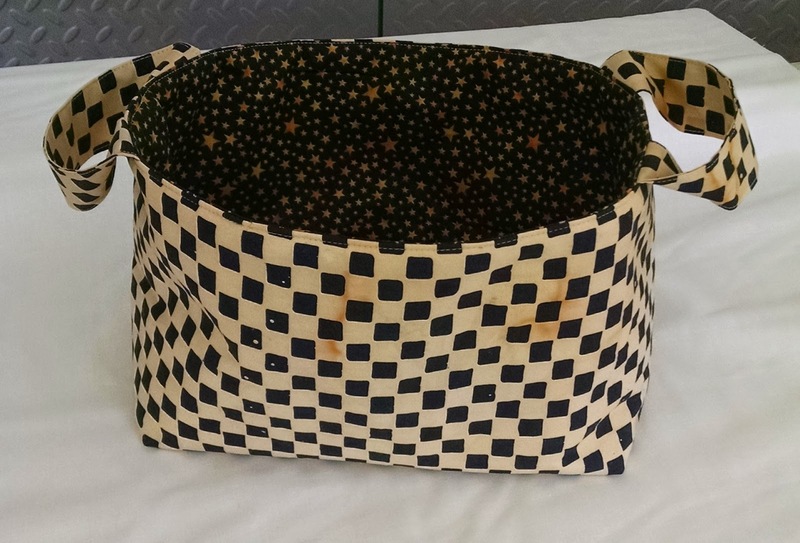 I have taken all the thinks I like about both bags and incorporated it into one design. I am working with denim and recycled burlap coffee bags. It is looking pretty awesome, if I do say so myself. The pictures will have to wait until next week. 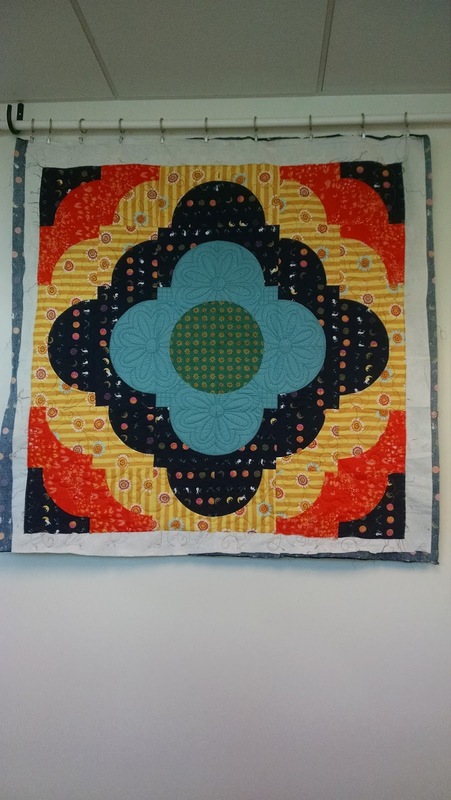 Over the past week, I have made a donation quilt for SAQA measuring 12 x 12, using the applique that I worked on in my class that I gave in the studio. The class was raw edge applique and we made some beautiful flowers. I am waiting to hear back regarding my entry for "In the American Tradition" of my Grandmother's Beer Garden quilt. 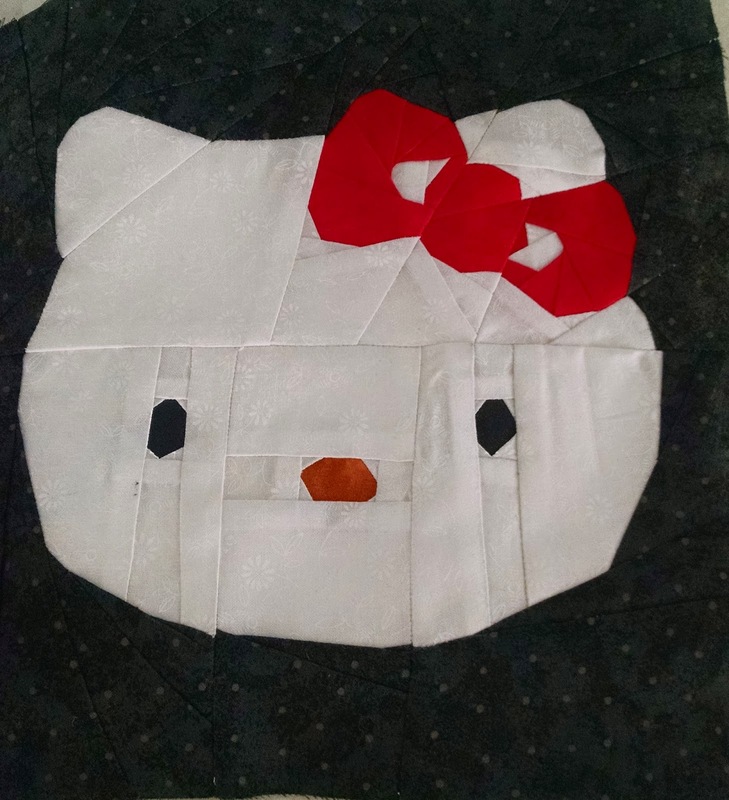 I have been working on a special medallion quilt, just the quilting, so I can get it back to it's owner and made various other small projects. 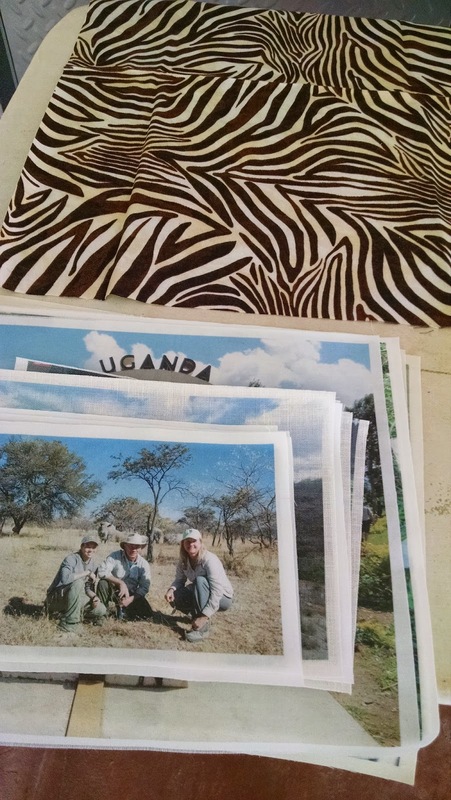 Life is busy but it sure goes down easier with fun projects. I realize I am a week behind, so hopefully will catch up in a day or so. Until then, keep on quilting. For this week's project, I made several bags. I know you, the public, find that hard to believe. Just kidding. I love making bags and quilts and most everything else. These little gems are called " Little Glam Bags" designed by Nancy Green for Pink Sand Beach Designs. The pattern was well written and easy to make. 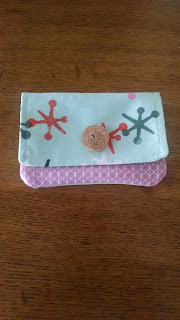 The first one turned out so cute, I had to make one with fabric and suede. Time has a way of flying by and I seem to be holding on to the tail of a tiger....that is running at high speed. I am presently trying to draw quilting designs on a Wacom tablet connected to my Creative Studio program. I am in the process of downloading the program to a laptop so I can be mobile in my endeavors. Hopefully, this will make me more productive and have better time management skills. I also am embarking on making original designs into silk screens so I can make designer fabrics. Not to mention, classes in the studio and working on my own art quilts. Lena- I mustache you a question and Living the good Life #3- Meet me on Kauaii will be traveling to Little Rock,Arkansas in June for a show- themed "Down by the Riverside". Lena is going into a juried show, so wish her luck. 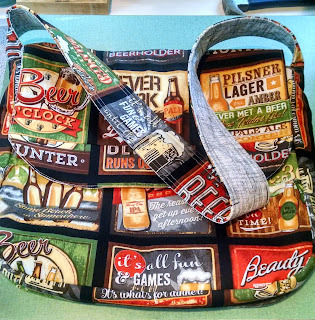 I just sent in an application for my quilt, Grandmother's Beer Garden"for possible admittance into the show "In the American Tradition" that opens in Houston in October 2015 and may travel internationally. I should know something about this by June 5th. I am also working on a very special art quilt for a call for entry into the SAQA's exhibition called "My Corner of the World". This quilt is near and dear to my heart, so I'm working extra hard on it. Meaning, lots of hand and bead work. Classes in the studio are weekly. I'm trying to get my name out there so more people can get the word. I am trying my best to attend guild meetings and still work full time. Yes, life is hectic. So until next week, or the end of this one when I post my next weekly project, live life to the fullest, don't settle for anything less than what you dream about and, as always, keep on quilting. Better late than never? That about sums up my crazy life at the present time. I'm opening up a working/ teaching studio in approximately two weeks and life is in fast forward. Learning Creative Studio on the Statler, setting up a classroom, working on the class schedules and individual class lessons, plus quilting, plus designing..... The list is endless. Sometimes I feel like I'm spinning in circles and lose sight of the big picture. Every road has led to this and it is finally happening. If anyone is in town on March 14 from 5pm till 9 pm, stop by the new studio. The address is 1660 Ord Way, Oceanside, CA. We will be serving wine and Hors d'oeuvres. And if you want to be kept up to date on all the upcoming events and classes I'll be offering, you can sign up for my email list right here. So on with the projects that I have completed and not had time to share. 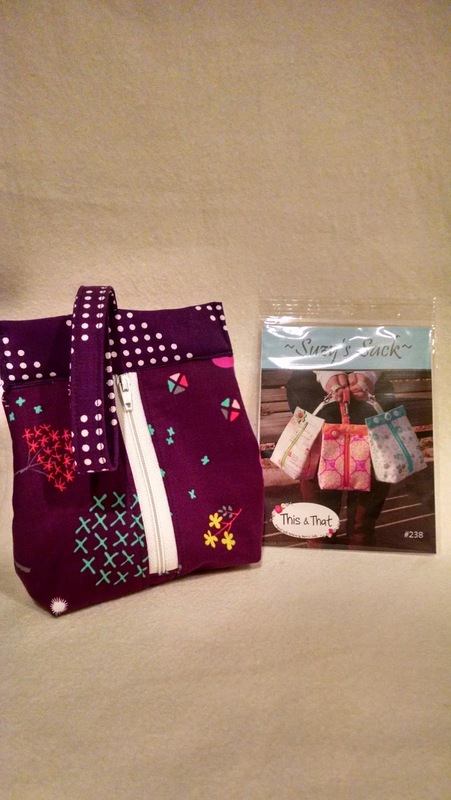 Learning the Statler Stitcher with Creative Studio. I had some quilt tops hanging around and thought "good, I have something to practice on". 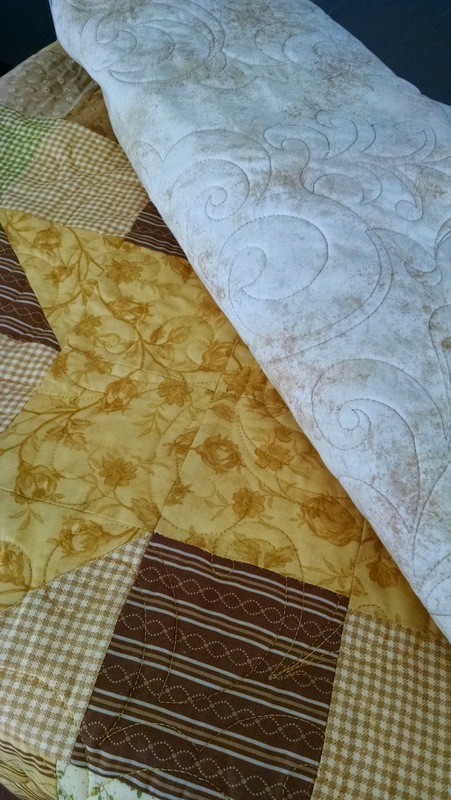 These two quilts were doing E2E (edge to edge). Not perfect but I learned lots and forgot lots. 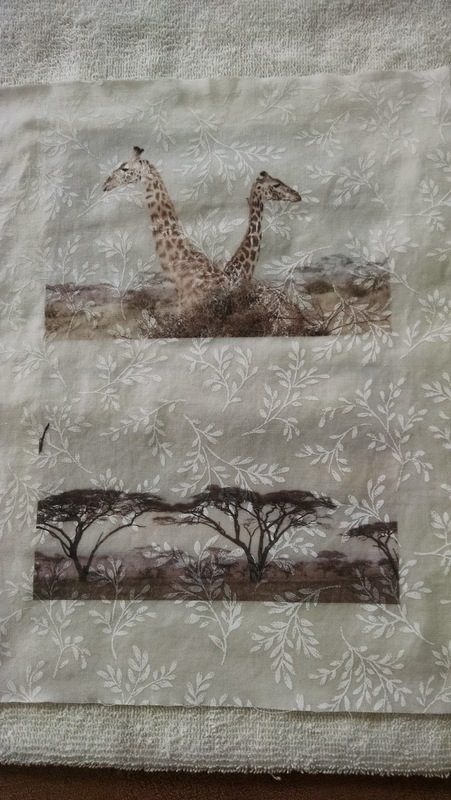 The one on the left is one of the very first quilt tops that I ever made, from inexpensive fabric, but I still like it. The one on the right was made several years ago with charm squares. The quilting is the star here, no so much the tops. Another two quilts using E2E. Improving but still not to the place I need to be. Steep learning curve for the technologic challenged, but with time and practice, I'm going to be awesome. 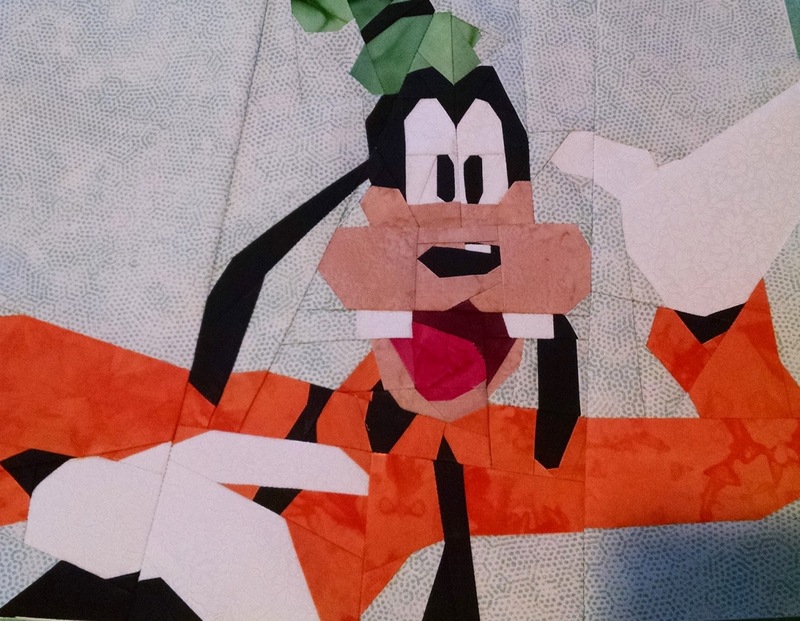 The quilt on the left is made from charm squares. 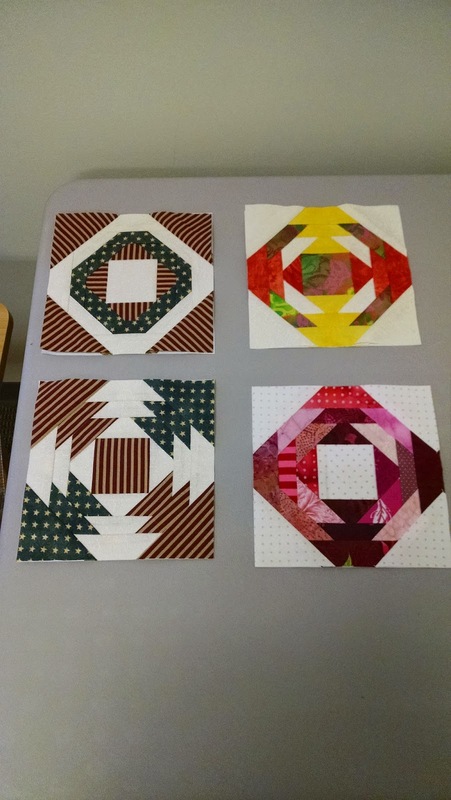 The quilt on the right was a cute little quilt kit with panels. 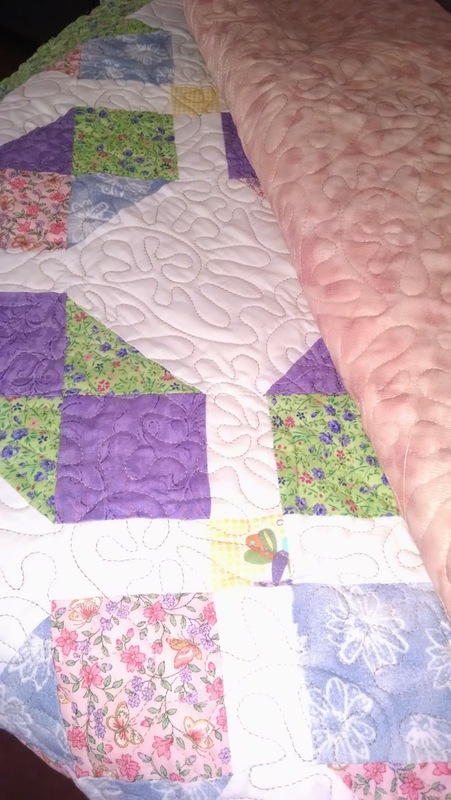 I'm loving the butterfly quilting but it could look better resized with tighter quilting. Live and learn. Making my own fabric photo paper. 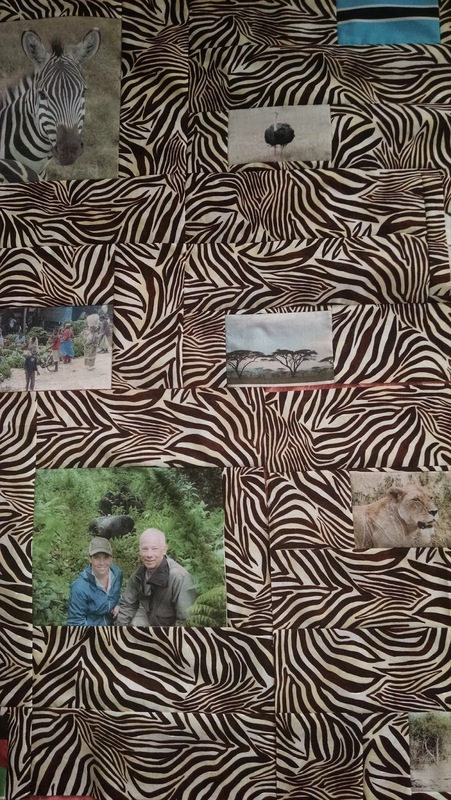 I have been commissioned to made a lady a quilt for her daughter from pictures from a month long trip to Africa, and even though I live in a big city, I ran out of my favorite go to fabric photo paper. The bulk of another brand was too thick for my printer, so I ended up taking off the backing on some and using freezer paper to make it work but still needed more. 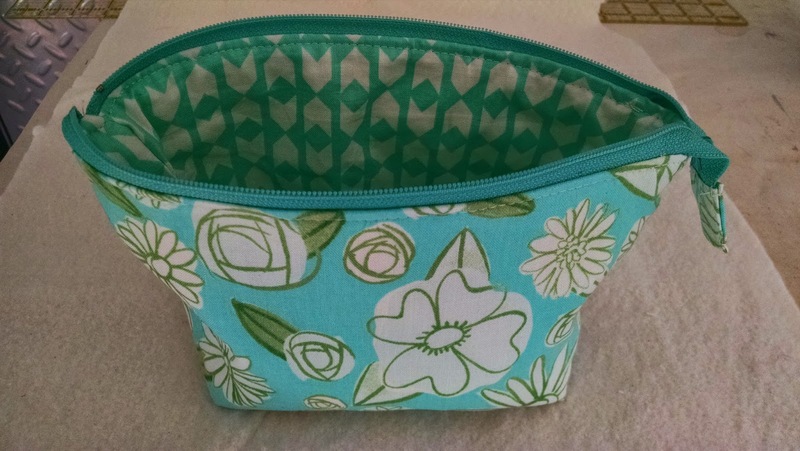 So when you want to stay home and still get your projects done in a timely fashion, you riffle through your stash and do one of the projects you always said you were going to try. I pulled out the freezer paper sheets, Bubble Jet Set 2000 and Bubble Jet Rinse by C. Jenkins. I've long forgotten which quilt show I bought them from but I'm sure you can purchase them online. 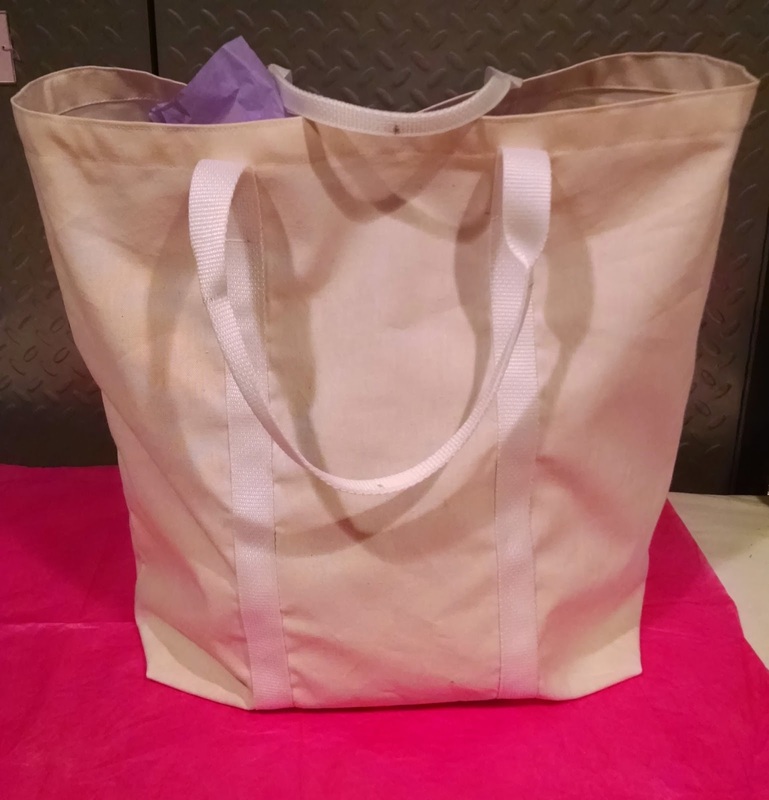 I used good muslin and then tried some tone on tone and was impressed with the results. 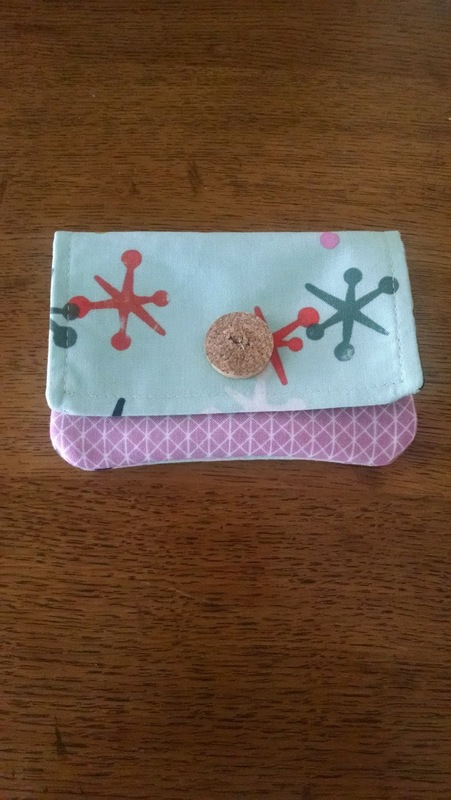 It was not very time consuming (although it did take more time than just purchasing it on your trip to the store) and it allowed me to choose whatever fabric I wanted to use. I needed a quilt top so that I could work on boundaries and blocks in Creative Studio- so I came home right before Valentine's Day, remembering that I had some blocks partially constructed for a quilt that I had long abandoned, pulled out the bags and went to town with them. They just happened to be red and white. I finished the top on Valentine's day and started learning this new technique. I felt this actually was easier than E2E and I really liked the results. I am actually binding it to give to a lovely lady in memory of her son. 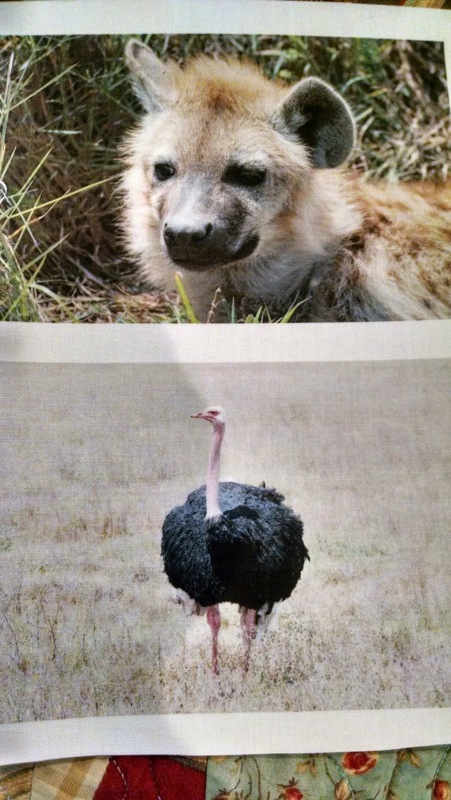 Back to the African project. I made all my blocks divisible by 4 inches and worked my designing magic. The girl loves zebras (btw) and although it's a little busy, I liked the results. If you come on the grand opening of my studio, you will see it hanging on the wall to surprise the one it is intended for. The mail is here and both my quilts, Lena-"I mustache you a question" and Meet me on Kauai have been selected for the Mancuso Mid-Atlantic Quilt Festival XXVI in Hampton, VA. The show will be at the Hampton Roads Convention Center in Hampton, VA on February 26- March 1,2015, If you are in the area, please stop by and check them out. 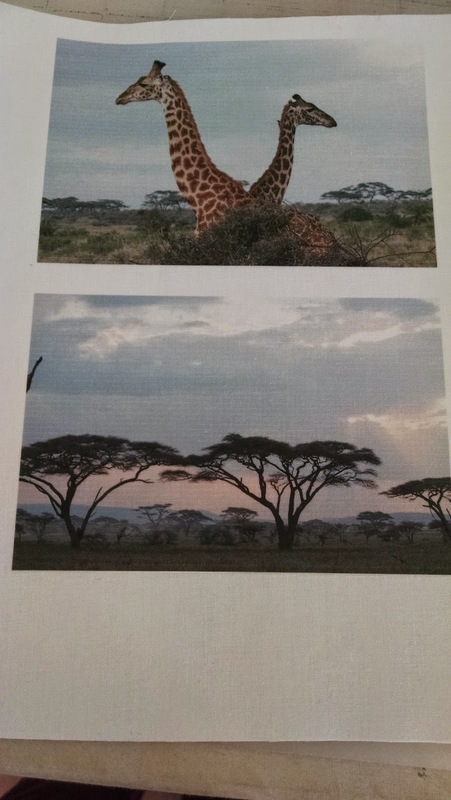 They will be in the pictoral section, I'm sure. Maybe one or both will win a ribbon. I'll just have to wait and see. Somebody send me a picture please! Well, today is February 7 and I am so totally behind in both blogging and posting. I guess I'll start with all the exciting things that have been going on in my quilty life. In October of 2014, at the International Quilt Festival in Houston, I bought a Statler Stitcher for one of my Gammill long arm machines. I was then so busy that I was unable to find 2 days for the installer to come and gut my machine. This finally happened in January. Kyle, spend a total of about 14 hours gutting the machine and installing the cpu and controller ( and all the other things , I have no idea) , changing out the track system and installing creative studio on the cpu. The first time that he hit the button and that machine head moved on its own, I was in awe and totally in love with this whole idea. The first thought in my head was " when can I put a Statler stitcher on my other Gammill?". Two weeks later I spent two days with a wonderful instructor named Jami, learning how to use creative studio and the Statler Stitcher. I came home full of hope and realized that I knew nothing. I could barly turn the thing on, so I printed out the 280 some page manual and took it to my regular day job to try and relearn a little of what I know is somewhere in my brain. All that being said, today is the day that I'm going to turn that monster on and try to make it my own. I will succeed , I just don't know how many trys that it is going to take. 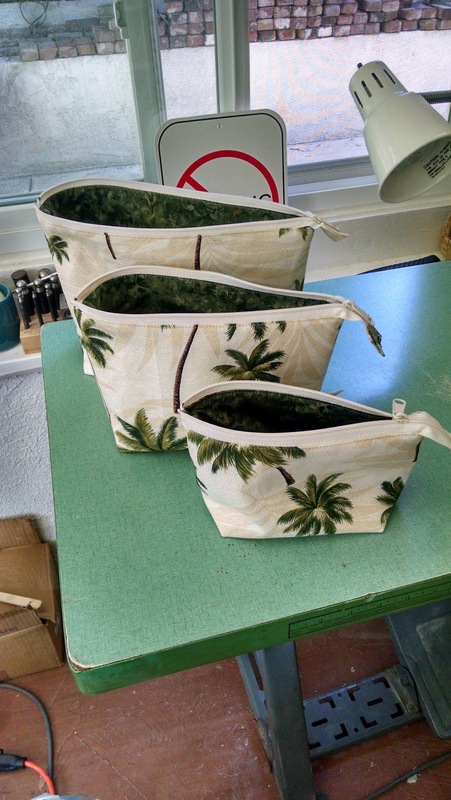 I made a pattern for and made 4 sandbag covers. This was in preparation for an outdoor show with my daughter and her handmade jewelry. I used heavy weight black denim, added ties which secured with Velcro and put a drawstring closure at the top. When all was said and done, I silk screened her logo on them. That canopy tent was going NO WHERE. I don't think there is that much call for sandbag covers or I would put out a pattern for them. I'll keep that on the back burner for now. Last week, I did all the paperwork and photos to try and get two of my new quilts into a juried quilt show in Hampton, VA. I should here back about that most any day and will post more information as soon as I learn the outcome. The rest of the day will be spend playing, I mean learning, on the Statler and trying to catch up on my weekly projects.I'm sure that I have done so much more than I remember but until I figure it out...Keep on quilting. 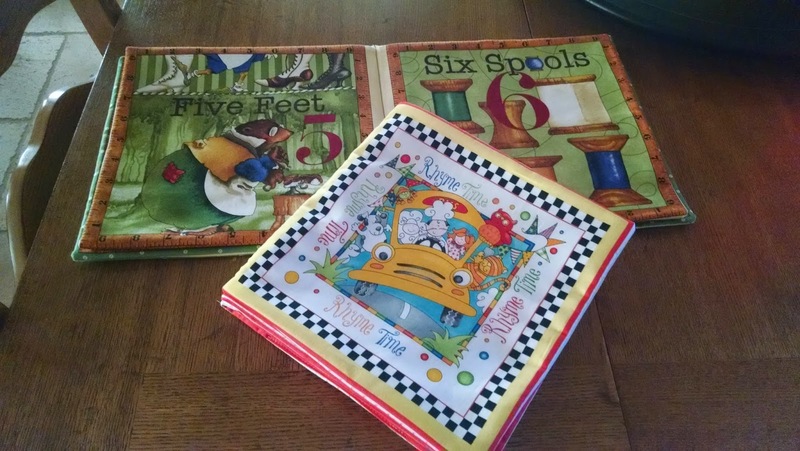 A few years ago, my oldest daughter and I had a challenge to complete and blog a project a week. We did succeed and I fully intended to do it again in 2015 and here it is already the 10th of January. I'm not sure how the time flies so quickly. I know I'm busy working two jobs, raising a 12 year old , staying in two adult children's lives and starting a new quilt studio, but SERIOUSLY!!! Now that I have committed publicly, it might make me step up to the plate and get it done. Anyone want to join me? I'm trying to keep up with facebook, instagram, blogging and starting a new website, what's one more little project? 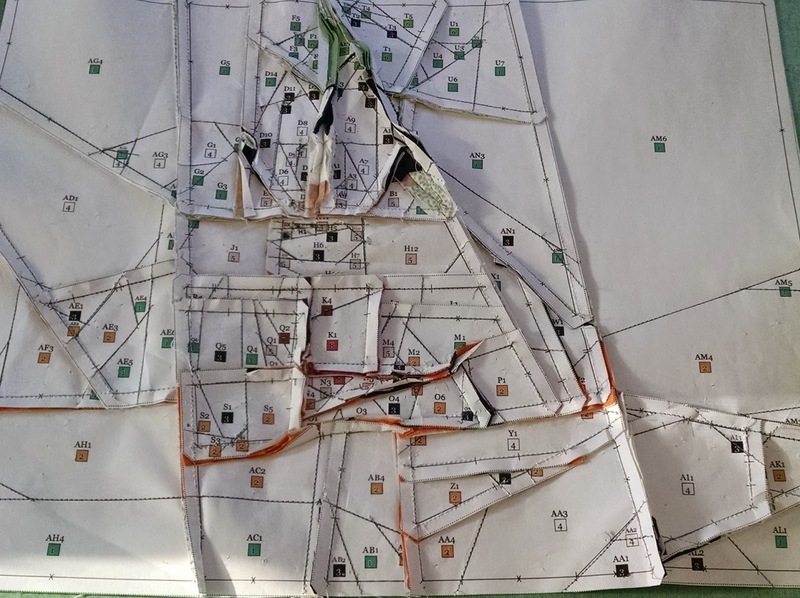 Near the end of December, I gathered all the projects and patterns that I have collected,made a list and a timeline. That should make it easier, right? 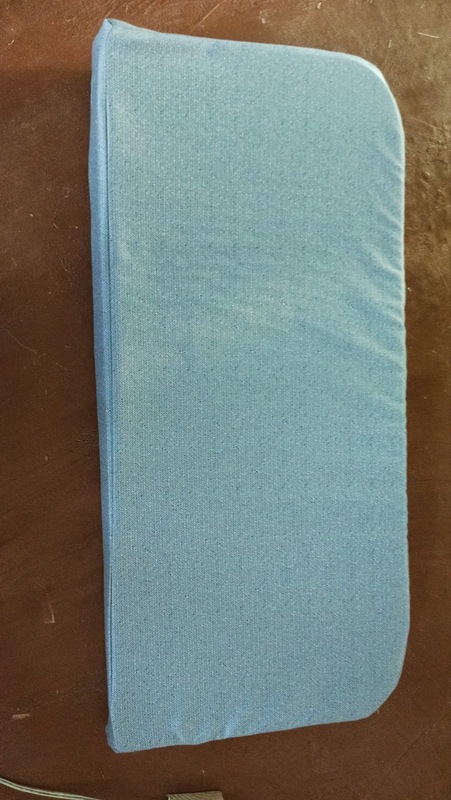 Fabric books. These are awesome. I never made them before and they were so easy. Each panel gives you directions on how to put them together and I needed an easy Christmas present for a child. After Christmas, I bought two more so when this special child gets a little older, I have more to give her. I bought them at my local quilt store but I'm sure you can google it and finds plenty. I'm sorry but I don't remember the names of these two. Amazing, I know, It's a bag. 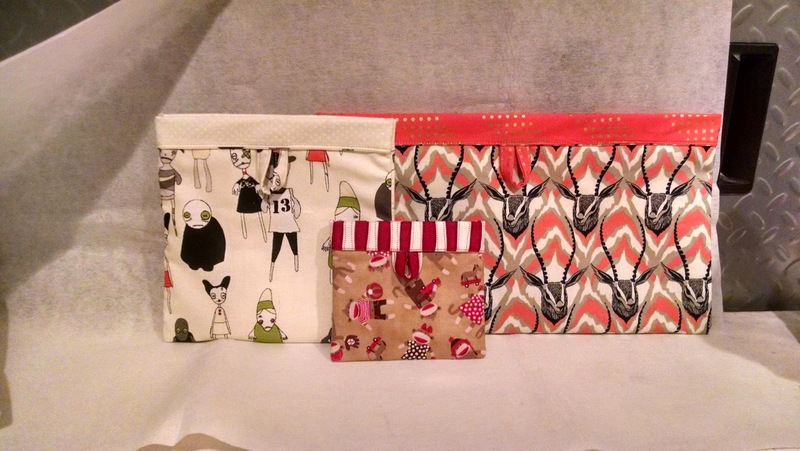 If you know anything about me then you know I am pretty much addicted to bag patterns. I don't make a lot but I sure do buy them. This year, I'm going to be making all the ones that I have bought. Okay, there is only 52 weeks so maybe not all that I have bought. 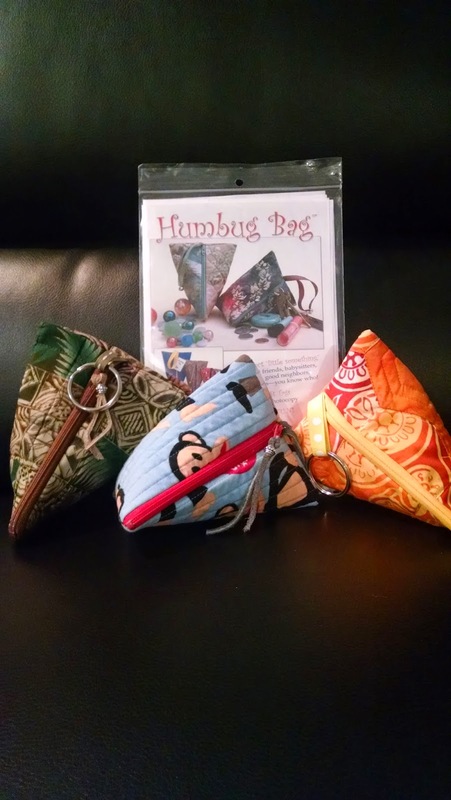 This little gem is the "Humbug Bag" the designer and author is McKenna Linn (formerly Nancy Restuccia). I couldn't stop at one, I had to make three. The monkey is my favorite. The pattern comes in 3 sizes but I only did the small one. As for patterns, it was relatively easy.Just read all the directions first, which was a little overwhelming since there are five pages. 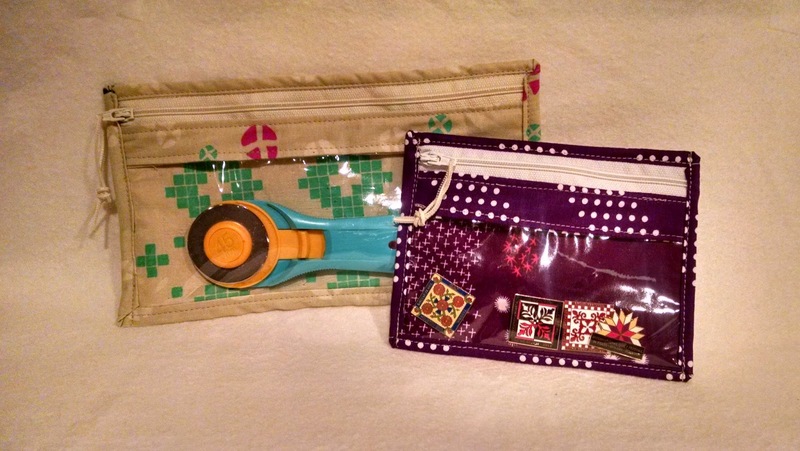 The bag itself is only two and there are directions on machine quilting. Okay guys, now I'm up to date. I know my oldest wants her bag done but I have to work on drawstring bags for sandbags, and add screenprinting to them. More about that next week. I think the most exciting news that I have to share is that I'm finally going to have a dedicated working and teaching studio locally in Oceanside, CA. I am very excited. It will be good to have a studio like I had back in VA. I'm not even sure how it all happened. 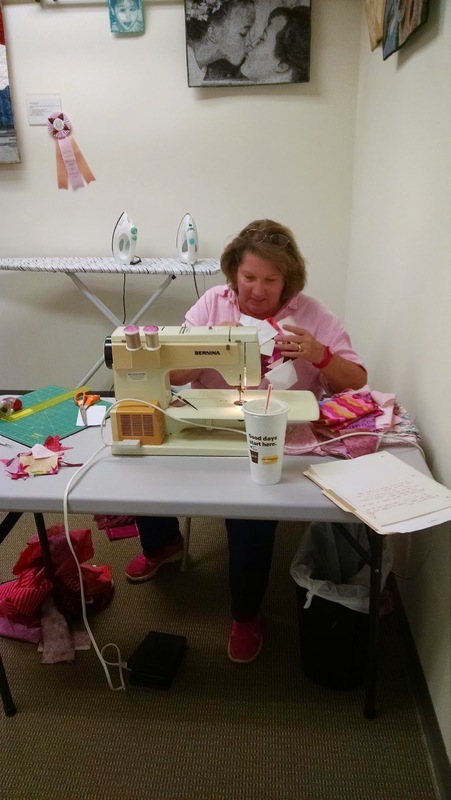 It all started with Houston Quilt Festival, something about a Statler Stitcher purchase, stumbling on the perfect location and the awesome universe that we live in. More to come soon, I promise. We will be having a grand opening in March, I hope. I promise to keep everyone informed.